Horrifyingly enough, the abused pit bull pup Caitlyn is not the only dog who has been found with her mouth taped shut. If this is a pattern, it needs to be stopped immediately. A third dog was found with her mouth taped shut near Denver, 9 News reported. The 8-month-old German Shepherd, named Dahlia by the shelter, had tape around her mouth and legs when passersby found her wandering along in the middle of the street, looking for help. 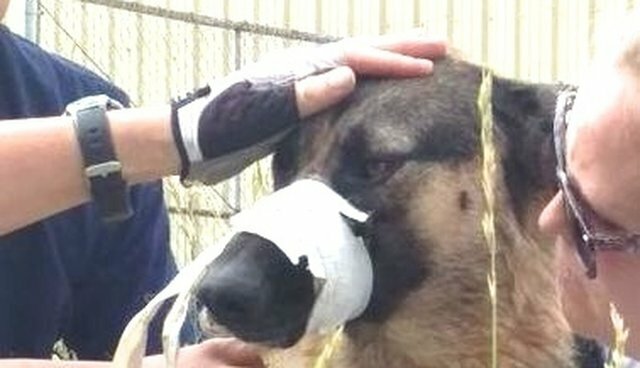 Her rescuers were able to get some of the tape off before help arrived, providing the pup with some relief. The sweet girl was otherwise healthy, and the Denver Animal Shelter found no other signs of abuse. "Dahlia initially appeared scared when she arrived at the shelter but has been quite social with staff and volunteers and is getting daily exercise and enrichment," a representative from the Denver Animal Shelter told The Dodo. Dahlia was not microchipped, and so far there are no witnesses to the crime. "That's like tying a human being up and forcing it beyond its will," commented one of the people who helped rescue the dog. That's exactly right. If you wouldn't do this to a human being, why would you do it to a helpless animal? This is the third recent case of a dog being found with her mouth taped shut, the first being Caitlyn, and the second being a little puppy named Otis. The fact that this is becoming a trend is horrendous, and hopefully whoever is responsible for this particular case is found soon. To help a pet in your area, check out Adopt-a-Pet to add a furry friend in need of a home to your family!